There may only be two area hockey teams, but that doesn’t mean our All-Herald Ice Hockey Team is lacking in talent. The Newington-Berlin co-op team made the postseason thanks to the first three members of our All-Herald squad. The Indians defense was anchored by senior captain Cole Pratte, who was a consistent defenseman all season long. Pratte puts as much time and effort on the ice as he does in the classroom, though. Pratte is an honor student and has been accepted to Central Connecticut State, the University of Connecticut and the Wentworth Institute of Technology. Pratte’s next plans are to attend UConn, where he is looking into playing club hockey. 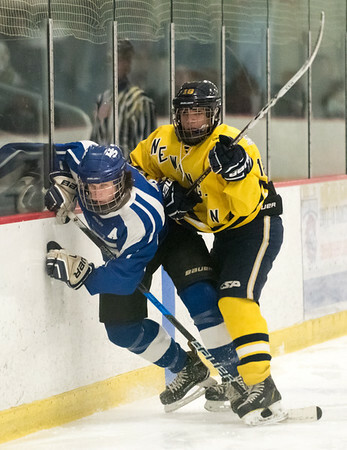 Our next Newington-Berlin player to make our team is right wing Nick DeRiu, a dual sport athlete who plays hockey in the winter and lacrosse during the spring. This season DeRiu had seven goals, seven assist for a total of 14 points. DeRiu is also a two-time Jingle Bell Tournament champion when he played with the Central Connecticut Capitals. DeRiu is just a sophomore but already plans on playing either hockey or lacrosse in college. The final Indians athlete on our team is junior forward Matt Lavoie. This season Lavoie scored 12 goals and had nine assists for a total of 21 points. The Hall-Southington ice hockey team ended its season 6-3-1, falling in the first round of the Division II tournament. The Warrior-Knights found much success after moving from Division III to Division II this year. Most of their success was led by senior goaltender Zach Monti. Monti had an 8-5 personal record and four shutouts. This season, Monti had a 1.88 goals against average, .922 save percentage and 308 total saves. Monti was a finalist his junior and senior year for Connecticut Hockey Goalie of the Year and was a Scholar-Athlete nomination his junior year. Now with his high school career over, Monti is looking at schools to attend, and has already been accepted into his top school, Michigan State University, but is still waiting to hear back from the University of Wisconsin. He’ll continue to play hockey in college, just for a club team. The last member of our All-Herald Ice Hockey Team is junior defenseman Chris Gambardella. Although Gambardella is just a junior, college is already in the back of his mind. Where he attends, he plans on taking part in its club ice hockey team. Gambardella has already been named captain for the upcoming 2018-19 season for Hall-Southington. Posted in New Britain Herald, Berlin, General Sports, Newington, Southington on Tuesday, 10 April 2018 14:21. Updated: Tuesday, 10 April 2018 14:23.